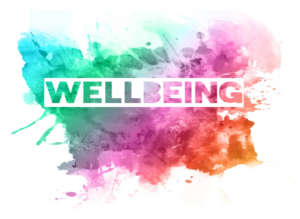 Sarah Stewart-Brown, professor of public health at the University of Warwick and a wellbeing expert, says: “Feeling happy is a part of mental wellbeing. But it’s far from the whole. “Feelings of contentment, enjoyment, confidence and engagement with the world are all a part of mental wellbeing. Self-esteem and self-confidence are, too. So is a feeling that you can do the things you want to do. And so are good relationships, which bring joy to you and those around you. Of course, good mental wellbeing does not mean that you never experience feelings or situations that you find difficult,” says Professor Stewart-Brown. “But it does mean that you feel you have the resilience to cope when times are tougher than usual. It can help to think about “being well” as something you do, rather than something you are. The more you put in, the more you are likely to get out. No-one can give wellbeing to you. It’s you who has to take action,” says Professor Stewart-Brown. Connect– connect with the people around you: your family, friends, colleagues and neighbours. Spend time developing these relationships. Be active– you don’t have to go to the gym. Take a walk, go cycling or play a game of football. Find an activity that you enjoy and make it a part of your life. Keep learning– learning new skills can give you a sense of achievement and a new confidence. So why not sign up for that cooking course, start learning to play a musical instrument, or figure out how to fix your bike? Give to others– even the smallest act can count, whether it’s a smile, a thank you or a kind word. Larger acts, such as volunteering at your local community centre, can improve your mental wellbeing and help you build new social networks. Be mindful– be more aware of the present moment, including your thoughts and feelings, your body and the world around you. Some people call this awareness “mindfulness”. It can positively change the way you feel about life and how you approach challenges. County Lines is a very serious issue where criminal gangs set up a drug dealing operation in a place outside their usual operating area. Gangs will move their drug dealing from big cities (e.g. London, Manchester, Liverpool etc.) to smaller towns in order to make more money. This can have a really big effect on the community who live there and bring with it serious criminal behaviour. 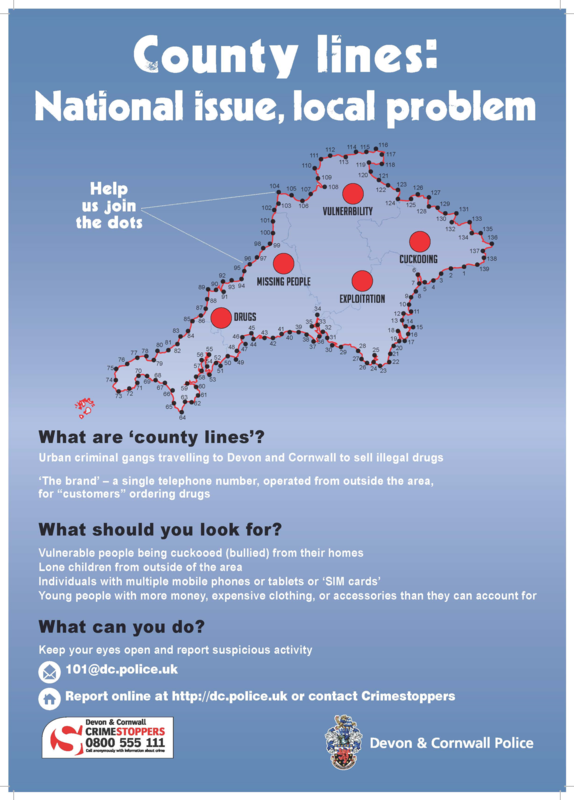 Drugs – County lines commonly involves the illegal distribution and dealing of seriously dangerous drugs from one city/town to another. The most common drugs involved are heroin and cocaine (crack and powder), but also MDMA, cannabis, amphetamines and spice. Violence – Gangs sometimes use violence to threaten children and young people when recruiting them. 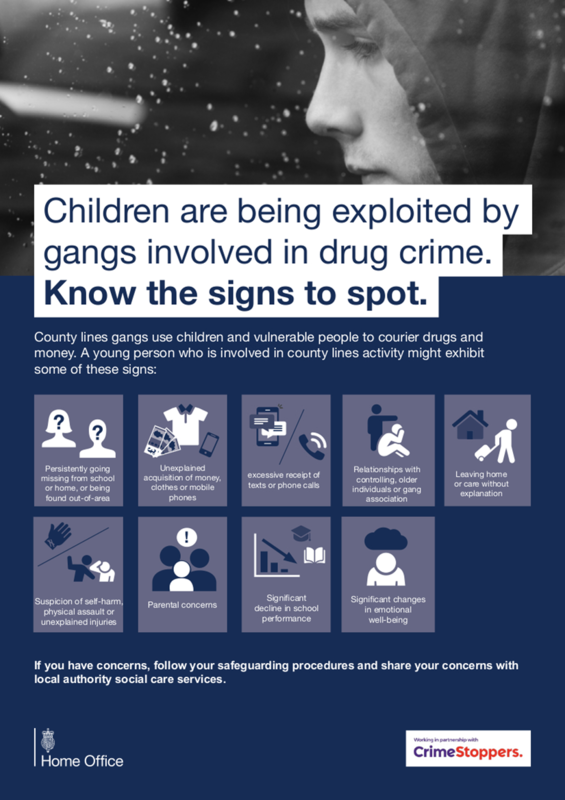 Gangs also violently assault children and young people working for them if they find their drugs or money to be missing. Weapons such as firearms, knives, bats, acid are sometimes used to make violent threats. Exploitation – Gangs recruit and use children and young people to move drugs and money for them. Children as young as 12 years old and up to 17 years old are recruited, often using social media. They are exploited and forced to carry drugs between locations, usually on trains or coaches. They are also forced to sell drugs to local users. Sexual exploitation – Young girls are often groomed and forced into relationships with gang members and are made to perform sexual acts. Here are some signs to look out for that can suggest that someone you know might be involved in county lines activity. Are they always going missing from school or their home? Are they travelling alone to places far away from home? Do they suddenly have lots of money/lots of new clothes/new mobile phones? Are they receiving much more calls or texts than usual? Are they carrying or selling drugs? Are they carrying weapons or know people that have access to weapons? Are they in a relationship with or hanging out with someone/people that are older and controlling? Do they have unexplained injuries? Do they seem very reserved or seem like they have something to hide? Here are some words/terms that are commonly used when describing county lines activity. If you hear someone using these words then they might be involved in or might know of county lines activity. Cuckooing – This is when drug dealers take over the home of a vulnerable individual and use it as their base for selling/manufacturing drugs. Commonly, drug users are targeted and are offered “free” drugs in exchange. Going country – This is the most popular term that describes county lines activity. It can also mean the act of travelling to another city/town to deliver drugs or money. Trap house – A building used as a base from where drugs are sold (or sometimes manufactured). These houses usually are occupied by someone (usually adult drug users but sometimes young people are forced to stay in trap houses) location. Trap line – This refers to when someone owns a mobile phone specifically for the purpose of running and selling of drug.